Anyone born on Christmas Day will always have to share their celebration with everyone else. And while you might feel you are overshadowed by all the hoopla of Christmas, or your uniqueness is not being fully appreciated, there ARE some perks. In our family, we always have a special time of day when we have birthday cake and birthday gifts for my son. And of course, the highlight of this time is our singing the "Happy Birthday" song... in four-part harmony. We often sing a reprise at the end because we are so thrilled at our own singing, and it always makes us laugh when we hold the note extra long at the end. The birthday person has to wait patiently, while the candles burn down. That's how we do it. For this card, I combined one of my Son's favourite Christmas activities, i.e., bringing home the Christmas tree, with happy wishes for a wonderful birthday. The perfect day for bringing home the Christmas tree is one when it is snowing big fluffy flakes. The background is a snowy embossed cardstock. The truck is from Heritage. For the tree, I used one from Joys of the Season... just a plain tree shape. A basic triangle shape would also do since the whole thing was being covered by pine branches (punched). See full list of carts used, below. Truck size: 4.56w x 1.79h. Wheels are 0.78w x 0.72h. They are not perfectly round on purpose. Banner: 7.0w x 2.58h. I used the road shape and made it long enough to stretch across the whole card width. I cut the truck twice - once from sparkle red, and once from plain red for the backing. It shows through around the fenders. The window is blue vellum. I made the black wheels using a circle shape and adjusted the size to fit. The hub caps make the truck more realistic. Using my Gypsy, I selected and sized the letters, placing them on top of the road where they would be cut out. No other embellishment or emphasis was needed. I like the understated birthday greeting. To make the letters follow the road shape, I used the kerning feature and slanted the letters left or right, appropriately. The outer letters (H and Y) are slanted the most, and the letters closer to center are barely adjusted at all. This technique was totally necessary, didn't take long and made a world of difference. Thanks for coming by my blog, Grace, via Selma's. Isn't she incredible? I am always blown away by her cards and I've been following her since we met on stampTV when it first started. 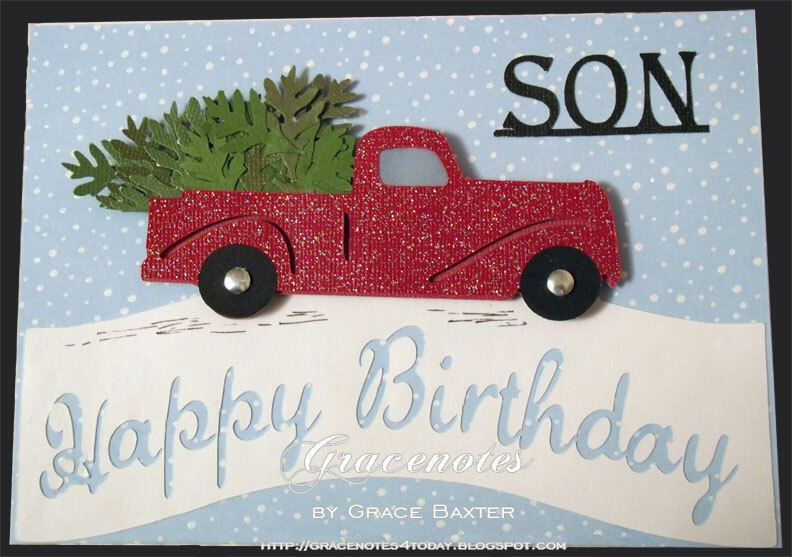 Love the tree in the back of the pickup on your son's Birthday card -- bet he liked it too!